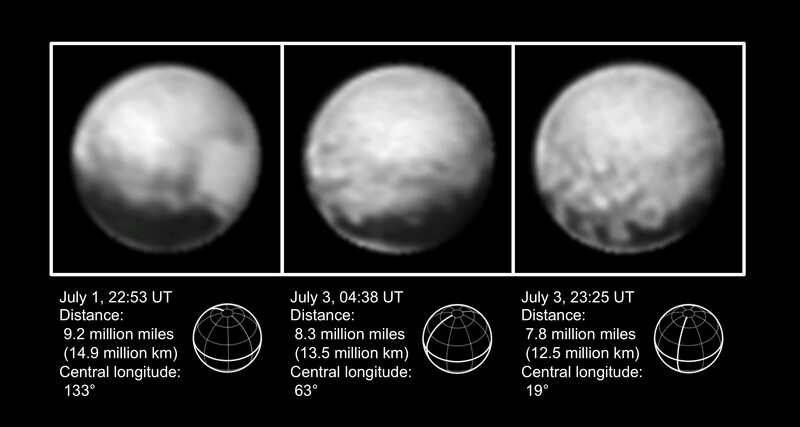 New Horizons is now in the home stretch with science operations scheduled to begin again today. If anything untoward happens between now and the July 14 flyby, the probe’s computer is programmed to reboot itself and continue gathering data and pictures from where it left off. Saturday’s glitch happened when the primary computer was compressing photos to store on a recorder while at the same time loading instructions for the upcoming flyby. Performing both tasks simultaneously proved too much for the system and triggered a response that put the probe in safe mode. Not surprisingly, my computer’s done the same thing, but I call it something else. During the anomaly, only about 30 planned observations were lost according to New Horizons principal investigator Alan Stern — a drop in the bucket compared to what’s coming soon. Stern said to “focus on the cake and not worry too much about the icing” regarding the data loss. Speaking of, the latest photos show those four peculiar patches ever more sharply along with emerging details and textures in the bright regions of the dwarf planet. Does that bumpy texture hint at craters? We’re right on the verge of seeing a clear picture, the same way a planet snaps into focus in a telescope with a slight twist of the knob. Even though we knew Pluto was pink and its largest moon Charon (SHARE-on) dark and neutral-colored years before New Horizons arrived, seeing them up close as globes makes it all the more real. During a press conference Monday afternoon, Stern explained that Charon formed in the aftermath of a long-ago impact between Pluto and another planet. Chunks knocked free from the collision congealed under the force of gravity to create the moon as well as Pluto’s other satellites. Charon’s mostly water ice like many other outer solar system moons. Pluto has a mantle of water ice but it’s coated with methane, nitrogen and carbon dioxide ices and possibly organic compounds, too. The dwarf planet also has a seasonal atmosphere due to its tipped axis and highly “eccentric” or elongated orbit. At closest, Pluto comes within 2.7 billion miles (4.4 billion km) of the Sun, while at farthest it’s a whopping 4.5 billion miles (7.3 billion km) away. Unlike Earth’s nearly circular orbit with only a few million miles difference between perihelion and aphelion (closest and farthest distance from the Sun), Pluto’s varies by nearly half, enough to cause nitrogen and methane frost on its surface to vaporize and form a thin atmosphere when near perihelion. It’s thought that as Pluto approaches aphelion, the gases condense and freeze back onto the surface. So far, no atmosphere’s been detected on Charon. This would make sense if it’s mainly water ice, since water at that distance would be too cold to vaporize. We live in a fascinating solar system where even the smallest objects have long and convoluted histories. Our curiosity can’t help but want to unravel their stories. I thought it was interesting how they are actually targeting Charon’s orbit on the assumption Charon would have cleaned out any debris from the area. It also runs the gamut on Pluto’s planethood. I’m glad they aren’t allowing safe mode events to occur during the flyby. I don’t know if that is a reaction to Saturday’s event or not, but it is good thinking. Thanks Troy for the link! I watched it Troy, thanx, it was worth, since described by the words of Stern and Brown.